The lowest bid for the project to clear Balboa Park’s central mesa came in almost 40 percent higher than a previous estimate – at least $83.5 million for construction alone. The cost spike leaves city officials and philanthropists to decide whether to proceed with a project hampered by legal challenges that have also spurred increased costs. 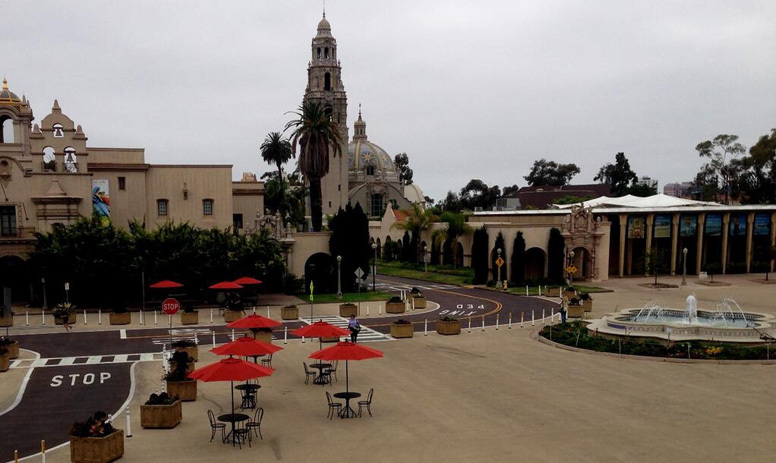 Construction bids for a controversial plan to overhaul Balboa Park’s central mesa have each come more than $20 million higher than earlier estimates, setting the stage for tough decisions for Plaza de Panama-overhaul supporters. Two years ago, a consultant hired by the so-called Plaza de Panama Committee projected construction on the project, which would clear cars from the center of the iconic park, would cost about $60 million. The city and other experts penciled in another $18 million in management and contingency costs, leading to a $78 million total estimate. Construction bids released late last week show the lowest bid came in almost 40 percent higher than a previous estimate – at least $83.5 million for construction alone. Other bids came in at $88.4 million and $105 million, totals the city says don’t include some costlier options the city and the committee could pursue. The cost spike leaves Mayor Kevin Faulconer, city officials and the team of philanthropists led by Qualcomm co-founder Irwin Jacobs to decide whether to proceed with a project hampered by years of legal challenges that have also spurred increased costs. The city and the Plaza de Panama Committee had previously envisioned the project might break ground this spring and be completed by summer 2021. For now, Faulconer spokeswoman Christina Chadwick said, the city is focused on vetting the three bids from local construction firms. Per its request for proposal, the city is poised to select the lowest qualified bid after it goes through the city’s review process. A spokesman for the Plaza de Panama Committee said this week that philanthropists remain committed to the Balboa Park makeover and optimistic about next steps. They had predicted increased costs. “We think it’s a worthy project or we wouldn’t be partnering with the city to make happen,” said committee member Jim Kidrick, CEO of the San Diego Air & Space Museum. There have long been hints of spiking project costs. As the city and philanthropists batted back lawsuits the past couple years, the state Department of Transportation’s highway construction index – seen as a reliable tracker of construction cost trends statewide – has jumped by a third. Chadwick said the city has also seen its capital improvement bids rise 25 percent to 30 percent annually. Per an agreement approved by the City Council more than two years ago when Faulconer revived the project, philanthropists – not the city – will be stuck with the increased bill if the Plaza de Panama project proceeds. The remaining amount – then estimated at about $30 million – was set to come from philanthropists. The committee will likely need to raise more money if the project moves forward and the city doesn’t update the contract. If the lowest bid stands, this could mean the committee must raise another $24 million than it had anticipated. Before a construction contract is inked, the current agreement says the Plaza de Panama Committee must formally pledge to bridge any gap between the city’s contribution and the updated cost estimate. The group has long planned to raise money to cover its share, but individual committee members would be forced to pay up if they can’t raise funds. The city and the committee both have openings to back away from the project before they sign off on a construction contract. The Plaza de Panama committee can bail if it can’t raise needed cash or if its share of the project rises by more than 5 percent. The city can also bow out if it decides the committee isn’t making sufficient fundraising progress, or if the city and committee agree construction bids are too steep. Neither the city or the committee has made that call yet. If the mayor and committee opt to proceed, they could face a newly empowered City Council likely to have lots of questions about the project. An increased project cost and the need for the city to pursue bonds to finance the project ensure that the City Council will need to sign off before it breaks ground – and new City Council members may be less likely to support the project. Meanwhile, at least one legal challenge continues. Attorney Cory Briggs, who had sued over the city’s plan to rely on bonds to finance the project, said last week that San Diegans for Open Government has filed an appeal. He expects the case to continue playing out later this year. The city and the committee got better news on another long-running legal case against the project last week. The state Supreme Court last Wednesday court denied Save Our Heritage Organisation’s petition for review following a lower court’s decision that the city was not required to conduct more environmental reviews when it revived the project two years ago, as the preservationist group had argued.